You probably have noticed by now that, here at Mashareeb, we love comics! At the beginning of this year, we have covered the launch of Tok Tok magazine (check it out here if you haven’t) and we are very happy to be covering yet another Egyptian comic magazine about to hit the shelves very soon! We have always believed in the talent of Egyptians to create comics and luckily, as time passes by, Egyptian comic artists never disappoint us. We got very excited when we recently discovered that some young Egyptian comic artists got together, with the dream of “jumpstarting and reinvigorating the comics market in Egypt” and formed a comic publishing house under the name of Division Publishing. The Division Publishing team is composed from Marwan Imam, Mohamed Reda, Mohamed Mazloum, Sarah Abdelazim, Gehad El Sheikh, Mohamed Khaled, Aamina, Tarek Abo Omar, Hatem Mahrous, Ahmed El Mojadidi, Salma Soliman & Tarek Diaa. We were very fortunate to get a hold of one the founders, Marwan Imam, and got to know more about Division Publishing, Autostrade and the state of comics in Egypt in his point of view. Enjoy! Give us a little idea about Division Comics, what is it about and what should people expect from its productions? Marwan: Division Publishing, is a Comics publishing house that is dedicated to invigorating the comics market in Egypt as well as giving a chance to a large number of artists and writers to have a chance to have an outlet for their work. We embrace the concept of Comics as a medium not a Genre. We believe comics are versatile enough to contain topics of a vast diversity. To us comics are not just superheores, they’re not just for kids.Comics have been known to handle topics as heavy as The Iranian Revolution and The holocaust to other worldly lands of space and magic all the way to the gritty and sharp social satire the slaps the cold hard truth in the face of the reader. Comics are a literary medium that embraces both the power of the written word and combines it with the aesthetic of the visual image transcending both and reaching lengths no other medium can reach in these respects. With this in mind, we try as hard as possible to find as much diverse and mature content to produce to the public. Be it fiction or non-fiction, we try to show how diverse and powerful comics could be.We also encourage experimentation within the medium, pushing it forward, in hopes of meeting the international level of comics production spearheaded by The US, France (and Belgium) and Japan. - How did you guys manage to form Division Comics and how did it all come to reality? Marwan: It all came down to who we are really. I am a comic artist and writer, and I’ve been around a lot of people within the underground comic scene in Cairo, even worked with them on a couple of projects.However there was one thing that was always expressed with an air of unadulterated frustration, that was the fact that no matter how hard we work, it is nearly impossible to get our work published. Most publishers in Egypt consider comics to be mere children’s books and treat them with less respect than they most truly deserve. Comic artists and writers were always frustrated that whenever they have a concept for a comic that is edgy or mature in terms of thought and content, they face rejection everywhere. My great friend Mohamed Reda, a comic writer as well as enthusiast such as myself and I then decided that instead of going around to find somewhere to publish our work, we should publish our own work,and in the spirit of independence we decided to start our own publishing house to not just allows us to publish our work but to allow for every single artist and writer that faced the frustration we did to get a chance to finally get their work out there. - What do you guys think of the state of Egyptian comics (past and present)? Marwan: Right now, the state of comics as a market in Egypt is dwindling nearly non-existent; however there is a hunger that can be sensed in people that is dying to get their hands on a proper comic or two.Not to mention a current outburst of comic artists and writers working on several projects a couple of independent books have sprung up here and there, proving that we weren’t the only ones frustrated with the current state of comics. In the past some efforts came up to try and build the comic market, yet it didn’t face enough success.I think this was purely because they treated comics very superficially copying what the west is doing without looking deeper into the core of this medium, or trying to find what our culture can add into the world of comics. 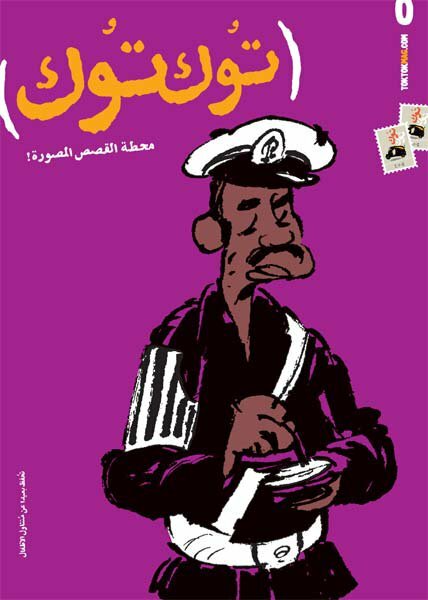 The biggest slap in the face of comics in Egypt though was Magdy el Shafee’s Graphic Novel metro that was banned by the government. El Shafee’s comic was probably one of the most compelling and mature contemporary graphic novels, and I’m talking on an international scale, because it recently has been reprinted in Italy with great popularity. 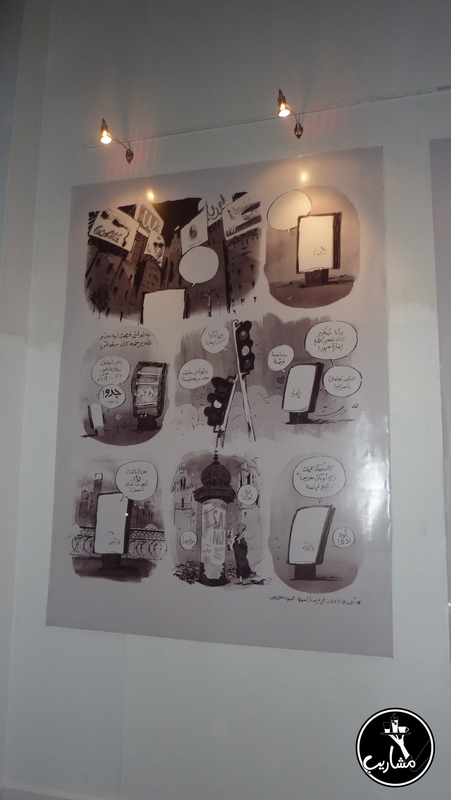 It was a social comics highlighting many of the corruption withinEgypt, and the old regime banned it. This ban was probably the worst thing that could have happened,however it only made us stronger and passionate about creating more work and challenging thes ystem even more. Magdy is even contributing with a new story of his own in our upcoming publicationAutostrade. - Do you think comics have a place in the Egyptian society? Does it have a future in Egypt? Marwan: I honestly believe Egyptians invented comics. This may sound crazy to some but the combination of pictorial and written elements in a sequential has debuted on the walls of Egyptian temples and tombs. These are the earliest of comics, perhaps preceded by cave drawings, but in Ancient Egypt it wasn’t just drawings, it was drawings conveying a certain message in a sequential manner while being juxtaposed with text. This is basically the definition of what a comic is. This just proves one thing, Egyptians are genetically wired to create and accept comics as a leading medium of communication. Once society understands that comics are not a genre of children books buta medium of diverse genres that can carry mature subjects and be read by all ages, it will flourish like nowhere else on earth. The amount of talent lying around in this country is overwhelming, I think we might have enough artistsand writers in Egypt to create a body of work in comics that is as big in size as the United States, and the only thing truly hindering us at the moment is the market. Once comics as a culture spread within the people the rest is just pure production. People are hungry for something new; they just need to be pushed in the right direction. This is the time for a revolution in comics. - Your first issue is called “Autostrade”, any stories behind the name selection? Marwan: Yes actually, and thank you for asking. First of all we needed a name that transcends language since this is a bilingual publication as well as planned for international release. So Autostrade being a commonTerm in several language was a good choice. However this wasn’t the main reason we picked the name.The name refers to one of Cairo’s main highways, and it generally refers to highways elsewhere in the world, and that’s exactly what this publication is about. Autostrade is a highway for comic artists and writers to reach their audience. This is the reason we created Autostrade and Division, to allow for all the talent to reach their audience. - Can you give us a little hint about the material “Autostrade” will be having? 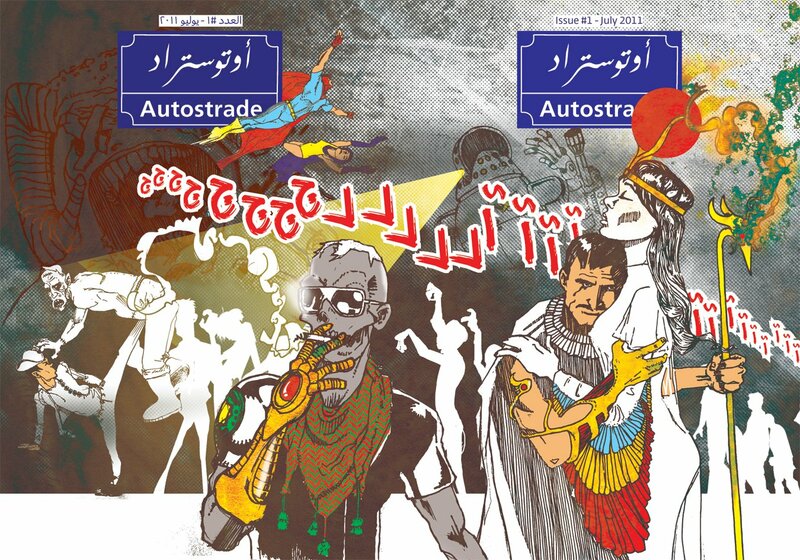 Marwan: Autostrade is what is known as a comics Anthology, it contains several stories by several artists and writers. It is a bilingual book, half of it is in English the other half in Arabic and that was to allow for as much talent to shine regardless of the language they are most comfortable working with. The concept of Autostrade is similar to that of Shonen jump in japan, even though it was inspired by the French publication “Heavy Metal”. What we do is we give every artist and writer 12 pages to write a chapter of one of their stories (or a short story), if the story is serialized then the writer/artist or writer-artist team would work on another chapter for the Autostrade issue that follows and so on. Then comes the audience participation bit, the readers are expected to vote on their favorite stories within Autostrade, the top stories voted for on our website: www.divisionpublishing.com, would getto become its own series, like X-men or batman for instance. That way the comic lines that we produce afterwards, would be ones that truly resonated with the public. The first issue contain a vast range of comics ranging from your not-so-average superhero action comics, to mind bending imaginative fantasy universes with a social backdrop and agenda, mythology based stories, others based on Egyptian folklore and superstition, science fiction mixed with an ancientEgyptian motif, Action comedy social satire, funny gag strips, re-imagining of famous literary icons and highly Experimental comics. I can’t really say more details because I would rather people experience it first-hand. - Do you believe in the power of comics? Can it really change something or affect people somehow? Marwan: I think I’ve answered that question in part throughout the interview, YES, I absolutely believe comics areprobably one of the most powerful literary mediums and I think when properly applied and producedcan create a lot of change in the world and truly propel society forward, because it combines both thestrength of books and image. A picture is worth a thousand words and the pen is mightier than thesword, combine both together and you get UNLIMITED POWER(and that sounds like something out of asuperhero comic, but hey we love all types of comics so unlimited power it is). We too, at Mashareeb, believe in the power of comics and we’re always happy to hear about a birth of a comics magazine in Egypt. 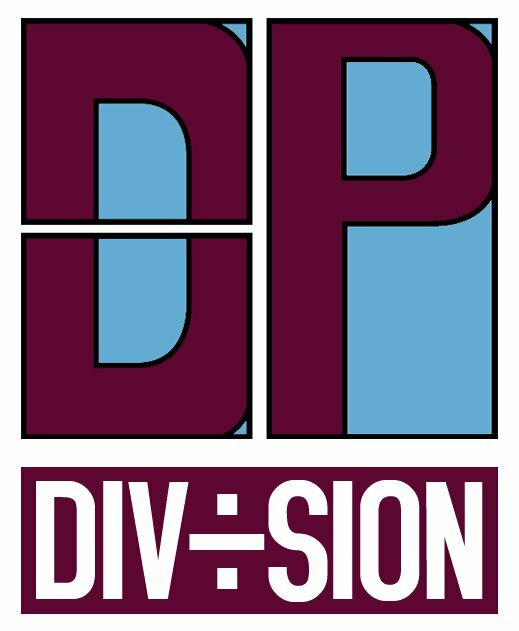 We wish Division Publishing the best of luck with their first issue Autostrade and beyond that too. Finally!…yes, finally! Egyptian comics have a new home and it’s called TokTok! 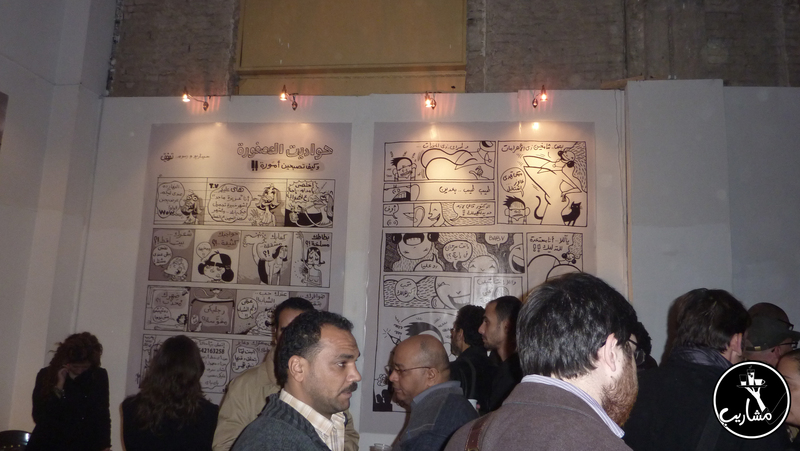 Mashareeb attended on the 9th of January the launch of a new Egyptian comics magazine by the name of TokTok. 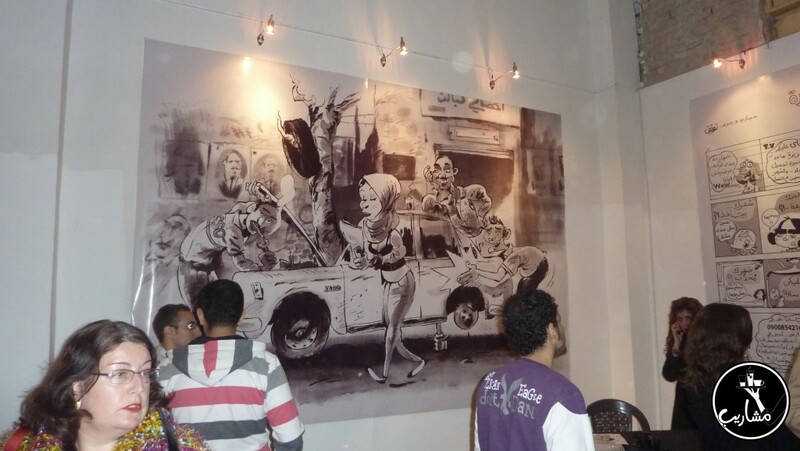 The launch event was held at The Townhouse Gallery in Downtown Cairo. There was some media to cover the event, the artists were there signing copies, chit chatting with fans and taking pictures with them. TokTok is a 100% pure Egyptian comics magazine, created by a bunch of young Egyptian comic artists, that will be released seasonally (every 3 or 4 months). The first issue (Isuue #0) was distributed at the launch event and all 500 copies sold out. Luckily, the creators of the magazine are planning on printing more copies and distributing them. The magazine contains short graphic novels (from 1 to 4 pages) by artists like Shennawy, Makhlouf, Andil, Tawfeek, Hisham Rahma, Khaled Abdel Aziz and Mona Sonbol. The artwork of the magazine is fascinating and the Egyptian spirit can be felt in all the stories and the drawing styles. The whole thing is not just graphic novels and comic strips, it also contains a short story, a poem and a section dedicated for talking about the history of Egyptian comic artists and their work (wich is a GREAT idea!). Their website is very interesting too, you can check it out right here (www.toktokmag.com). If you do comics, you can participate by sending them your work while following their submission specifications. And if comics are not your thing, you can submit background artwork for the website (their background changes frequently!). All the info you need for submissions can be found here. 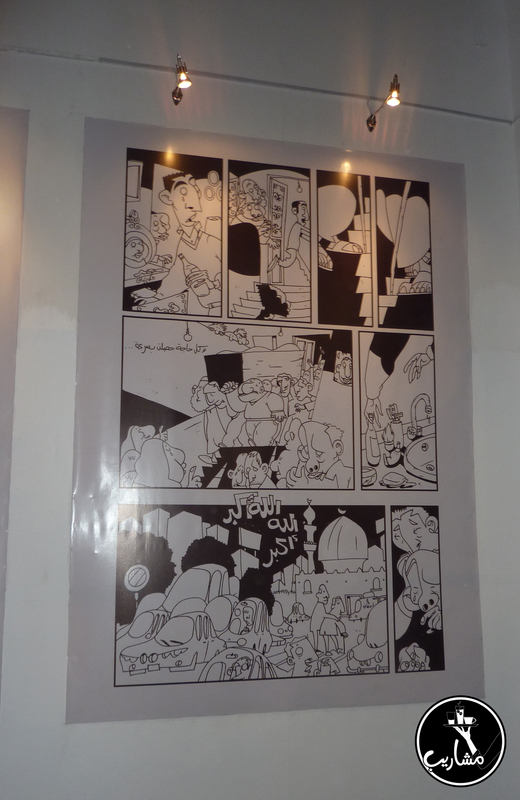 It’s been a while since Egypt had its own comic magazine and Egypt is no way near being short of great comic artists. We can’t express how happy we are with the launch of TokTok, it’s like a dream finally come true. We wish the magazine’s team success and we are already looking forward for issue #1! 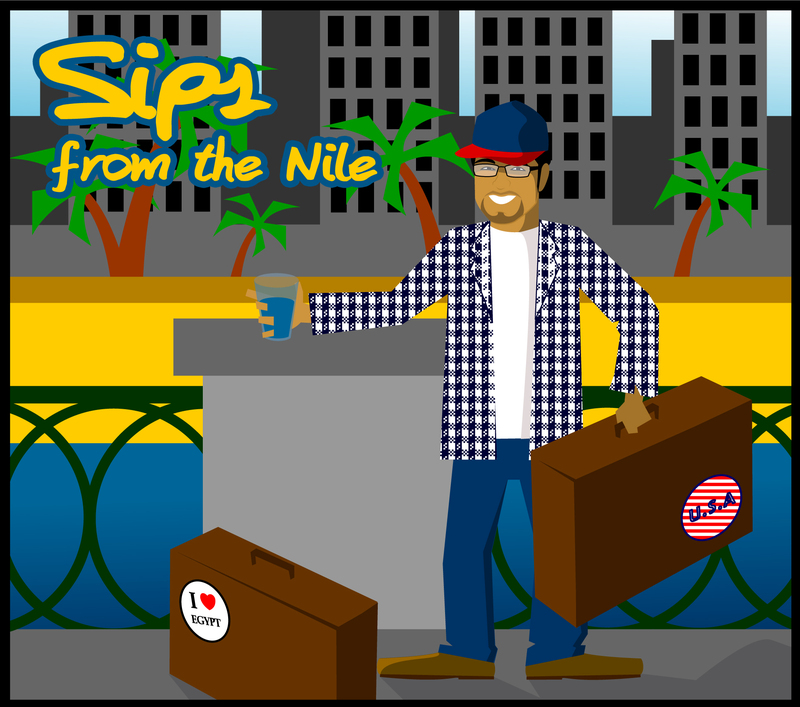 “Sips From The Nile” is a series of articles, written by Basil El Dabh, that will be featured on Mashareeb. Basil is an American born Egyptian who decided to move to Egypt for a couple of years after graduating from college for a job opportunity. He writes about his experience going back to his roots and living in Egypt after spending his whole life in the United States. Where else can you more fully appreciate the concept of family and community? Growing up, my frequent visits to Egypt gave me small doses of the true meaning of family and the breadth of its definition. Sure I have my grandparents here, but I also have cousins, and no I’m not just referring to my aunts’ and uncles’ kids. Here, cousins can be your second cousins, your parents’ cousins, cousins of cousins…even friends of cousins. At times, it feels like there are only one or two degrees of separation between any two people here. When people say, “Let me know if you need anything,” they mean it. It’s a commitment to action, concern and a sincere willingness to actually help. Upon first glance, Cairo can be overwhelming to many. It’s a virtual 24-7 rush hour, but upon further examination the contrasting community dynamic is eye-opening. You are bound to run into people with ulterior motives but when you really get to know people here, they tend to be very welcoming. I’m one of the only foreign-born people in my workplace, which initially made me nervous, but where this would lay the foundation for alienation in many places, coworkers have seen this as an opportunity to lend a helping hand, even with my shaky Arabic. Where else can you be further removed from the monotony that comes so easily with life in general? Even with a 9-5 job, I am far from living a 9-5 lifestyle in the normal sense. In the City that Truly Never Sleeps, punching out at the end of your workday only marks the day’s halfway point. It marks the beginning of enjoying time with friends and family at bars, cafes, or one of the countless venues for nightlife in Cairo. A relaxed mentality here blurs the line between weekday and weekend evenings. If it’s 10 pm and there is an errand I want to run, I don’t even look at the clock. If I get a call from friends at 11, I get dressed and walk out my apartment door without hesitation, whether it’s a Tuesday or Friday night. Life here teeters between relaxed and fast-paced, but definitely far from routine (similar to Cairo driving). Where else can you find people that know how to have a good time any more than they do here? It goes beyond the nightlife too. Even taxi drivers who may not lead the most comfortable lives find ways to laugh with their passengers and find ways to smile while maneuvering through the often-frustrating traffic. Those with the means to do so often escape from Cairo during the weekends to enjoy the beautiful beaches on North Coast or Red Sea with friends. At the end of the day here, though, good times are dictated by the company, not the location or activity. Will I still be living here ten years down the line? I have my doubts, but they have a saying here that roughly translates to “Once you drink from the Nile, you keep coming back for more.” I know that wherever life takes me, the sip I’m currently taking will leave me with a thirst that will repeatedly bring me back here. A year ago, a very interesting song called “Yama Dagit” was aired on Egyptian music channels and the artist behind the song was called Azzam. The song had a groovy bass line and beat, very funky guitar riffs and keyboard chords and surprisingly…a rababa, a nay and upper Egyptian (se3eedy) vocals! We were very curious about the song and the artist, so we decided to do some research and what we have discovered might be a BIG turning point in the history of Egyptian music. …show people the truth, that it has in fact, not been lost, and though we might live in a ‘globalized’ world today, we can forever maintain and understand our roots and identity – through music. Furthermore, we can export our culture to the world with a new refined image that would help bridge the gap between the Middle Eastern and Western cultures. And the secret behind Zenouba and Azzam, the great discovery we came across, was Hybrid Records. The label was founded by Ahmed Azzam and Mohamed Ghorab. Two people with a great experience in music and media production and a history that speaks for itself. The label has a lot of various musicians like Naseer Shamma, Digla and Hisham Kharma and have already released 14 albums (that you can check out and buy from here). A label like this marks a huge step in the Egyptian music industry and can not be denied what so ever. It will definitely help export Egyptian local talents, retrieve our lost wonderful folklore and save the Egyptian music and its identity. Hybrid Records is the rebirth of Egyptian music. We suggest you become a member of their mailing list, follow them on Facebook and check out their Youtube Channel. We will be covering a lot things about the label, its founders, artists and albums in upcoming posts. We will also have an interview with the man behind the Hybrid Records sound and the Zenouba project, Ahmed Azzam. So stay tuned, this is only the beginning. Pretty much the most famous band in Egypt (after West El Balad) but probably the most talented one. I can’t imagine someone living in Egypt not knowing about Eftekasat, this band can not be missed. Eftekasat is an Oriental Jazz Fusion band from Cairo. They started up around 2002 and released their first album Mouled Sidi El Latini (The Latin Dervish) around 2006 and their second one Dandasha was out early 2010. What makes Eftekasat very special is the different musical influences the band members bring in. Their music blends oriental instruments and scales with some jazz and funk beats and keyboard chords accompanied by, what would be their “cherry on the cake”, electric guitar riffs and solos. Their sound is very original and unique, you can easily tell it’s them by listening to just 5 seconds of a song. It has a warm familiar Egyptian feel (the nay, the violin and the accordion) and a funky and groovy kick to it. Recently, the band had some changes in their line-up, which can be a little tiny bit noticeable on their second album, but the Eftekasat spirit can still be felt and their distinct sound can still be heard. They are mainly an instrumental band, which is why some people find it hard to listen to them, and that’s an issue with our beloved people that we need to work on. The concept of instrumental music really needs to be more introduced, appreciated and understood in our society (even though a lot of people do listen to Omar Khayrat!). This is probably Egypt’s finest musical product in years, and the band most definitely deserves a listen. This won’t be the last time you hear about them on Mashareeb, we will talking more about them in the future posts and we will soon be posting reviews for both of their albums. Until then, you can go check their albums out at Virgin Megastore (City Stars) or you can find your way to get their stuff online. and if you get the chance to see them play live, do not miss it!